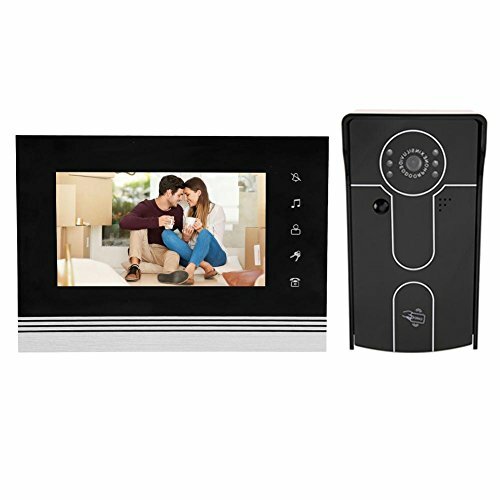 Features: Video intercom, unlock, monitor, No disturbing, 25 chord music, speaking between intercoms. Visitors video. When visitor coming, open the indoor unit to video talk, convenient and quick.White 7-inch large screen. TFT digital high-definition LCD display, show your good taste. Unlock function. Indoor unit comes with unlock button, just need to push button gently that can control the door, no longer have to go out to open the door, it is convenient for the elderly to use. Strong hardware. Doorbell core anti-interference, radiation protection, high sensitivity, fast computing speed. 700 line CMOS color digital high-definition camera with super backlight compensation. Infrared night vision. Outdoor unit configuration 5 LED infrared night vision fill light, professional infrared night vision and backlight compensation, dark night light as daytime, face clearly visible. Multiple users can view at the same time. Can support two simultaneous indoor phone call, to meet the needs of the use of video talk at different room, enjoyable.